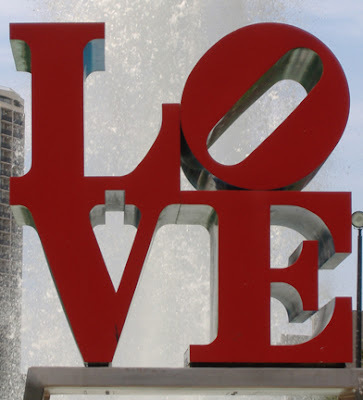 I visited my beloved city of Philadelphia yesterday with my friend J. I hit some of my favorite spots and J happily tagged along. Upon arriving, we fueled up at Au Bon Pain, conveniently located in the train station (30th Street Station). After getting off the subway in Center City and emerging next to City Hall, we walked through the tents and protest signs of the "Occupy Movement." J asked me what I thought about their ideology, but this is, honestly, the first time I've heard of it. Apparently I need to find out what's going on with this nationwide string of protests! We headed to the shopping district along Walnut and Chestnut Streets, stopping into some of the stores. I bought my boss a cute little birthday gift at the beautiful boutique called Tselaine, which is on Walnut at 20th Street. In the neighborhood, we went back to the Italian market called Di Bruno Bros. for lunch. We dined upstairs in the cafe, which was first for me. My chicken cutlet club sandwich with Abbruzzo sauce on foccaccia was delicious. 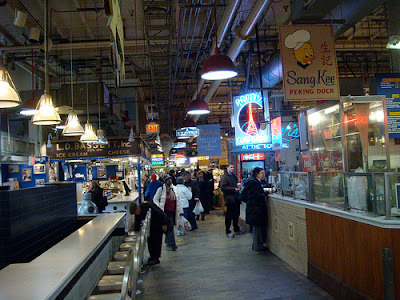 Next, we walked down almost every aisle of the Reading Terminal Market, a huge indoor market. Obsessed with food, it's my favorite place in the city. So many temptations... Every stand has something interesting! Luckily, we went on a Monday and it wasn't absolutely crammed with people. We ate delicious ice cream from Bassett's which is one of the original stands. Recently celebrating their 150th anniversary, we sat on stools and paid some attention to a video documenting their long history. I also picked up cranberry/ pistachio and chocolate/ cherry biscotti from the Termini Bros stand. It is delicious as well. I have been looking forward to eating it with espresso for breakfast at home for awhile now. Even though they're very well done, I'm not sure if I can profess my undying love for biscotti... It's kind of like stale sweet bread. Nonetheless, it's nice to change it up. I also purchased a postcard for my penpal, making sure it had a Philadelphia postmark later. See Bassett's Ice Cream on the left.